Revealing mistake: Jeannie is not supposed to see Marty at all, but when she is in her flat and she is getting up off her sofa, she is seen walking around him, as if she can see him. Revealing mistake: Dialogue in the episode specifically mentions the A2 and A282 roads near Dartford, Kent - the actual roads used were the A1 Barnet by-pass, Galley Lane and Well End Road. The error is revealed by the sight of a road sign that appears just as the Austin Princess Limousine turns on the the main road - the sign shows that the car is not turning on the the A2/A282 near Dartford, but the A1 at Barnet some 40 miles away. When Jeff Randall goes to the "Glasgow Tenement" (just after the opening title sequence) watch the graffiti on the walls behind him. One piece of graffiti shows the "stick man" logo from "The Saint", over which is is written the words "IS BENT". 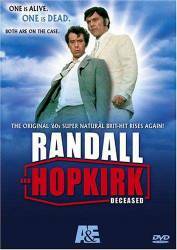 This was an in-joke by the crew of Randall & Hopkirk (Deceased) as, at the time (September 1968) they were filming back-to-back episodes of "Randall & Hopkirk" and Roger Moore in "The Saint" at Elstree Studios - even to the extent of using the same props and scenery.